Traditional crafts have always provided man with household utensils, personal equipment and things he needed at work. All these products were also important to market merchandise. As for the locals, their work offered them possibilities to pave routes to distant lands and broaden their horizons. Today traditional crafts hold a significant place in Slovenia, both economically and in the national culture. Traditional craft is an important ingredient of Slovene cultural heritage. It reflects the influence of different Slovene regions exerted on each other for centuries. Slovene shoemaking industry has a strong back-up in traditional shoemaking in Tržič, Turnišče, and Žiri, hatters in Škofja Loka while straw hats originate from Domžale and Mengeš. Traditional shoemaking heritage is preserved in the museums in Tržič and Turnišče, the latter boasting an old reconstructed shoe-maker house. It shows the life and work of a shoemaker from Turnišče during the period between the two world wars. Today, pottery is developed in Komenda, in Dolenjska, near Krško, at Ptuj, Ljutomer, Pešarovci, etc. Potters also sell their products at numerous fairs in different Slovene towns. Even today, they offer different clay pots and objects that were already used by our ancestors. Ribničans have been peddling their Suha roba (wooden utensils) around Europe since ever. They obtained permission to trade freely in their products as early as 1492. That enabled them to peddle in Austria, Hungary, Italy, Germany, Greece, and Spain. They went even as far as Africa and India. Today a suhorobar (wood smith) from Ribnica can be met at every fair in Slovenia. In Ribnica, they annually organize the Ribnica Fair and rich heritage of the wood smiths is on display at the Ribnica Museum. There is also a well-known song about the Suha roba and Ribničans “Ribn’čan Urban”. Suhorobar actually became a symbol of our opening into the world and earning our living by making what we can out of what is at hand. The traditional craft of making honey products also used to be called “krajcarkšeft” (Kreutzer business) since candle makers and lectures (they made honey products) only deal with small money. Even today you will still find some family workshops with a long tradition. Making small ornamented honey pastry is particularly developed in Škofja Loka and its surroundings, where those products are called small bread. In Škofja Loka the dough is pressed into handmade wooden moulds while in Dražgoše they are hand-made. Everything that is hand-made has a great meaning from the person who made it, to the one who bought it. In this case, candles come in a variety of shapes and colours, and everything that is hand-made cannot be duplicated. Even if the creator tries to make the same candle, it will certainly be different every single time. Color, shadows, and the mood of the creator will affect every piece of artwork he did himself. The same hand-made craft or ornament can tell a lot about the buyer, too. Those are rare, but worth pieces can inspire you, they can make you feel special, that is why it’s so important having those little shops opened, with the tradition that dates almost more than a century. The coloured ornamented honey pastry is made in Ljubljana, Kamnik, Slovenj Gradec, Ptuj, Metlika, and Ljutomer. One of the oldest family crafts is wickerwork and not so long ago it was mastered in every household. Baskets, wickers, and straw baskets were made during the winter in every family. Wicker makers mostly use hazel and willow twigs, but objects made of straw and corn husks are also very interesting. A Ribničan displays Suha roba, this time in Bohinj. His products range from wicker baskets, graters and wooden spoons to straw hats, small planks and numerous other objects of useful or ornamental value for your home and household. Small bread from Dražgoše (Dražgoški kruhek) is something special. Diligent hands of farmers ’ wives make the honey dough and then the pastry out of it. In Škofja Loka, the dough is pressed into a carved wooden mould and baked. In Slovenia, lace first appeared in Idrija and then spread to the Žiri basin and to Železniki. Lacemaking used to provide an important additional income in the miners ’, forgers ’ and charcoal burners’ families. When the last furnace was extinguished (in 1902.) in Železniki, lace making became the only source of income for numerous families. In those parts they still make lace. To keep the tradition alive they founded the Lace making school in Idrija. Lace differs in patterns and knots from town to town. Even today wickerwork is one of the most common crafts and numerous artisans offer a great variety of products. Lacey began to develop in the 17th century in Idrija where we can find the only Lace-making School in Slovenia. This activity used to bring a more than welcome additional income to miners’ families. Today, famous Lace-making towns are Idrija, Železniki, and Žiri, while skillfully made lace from tireless lace makers is greatly appreciated and demanded merchandise. A bobbin tape lace is made almost exclusively in Idrija, in western Slovenia. This art is passed on to a new generation from the previous one, every time adding the new ornament to it. Licitar hearts are made from gingerbread like substance, and it’s usually made in the shape of a heart. 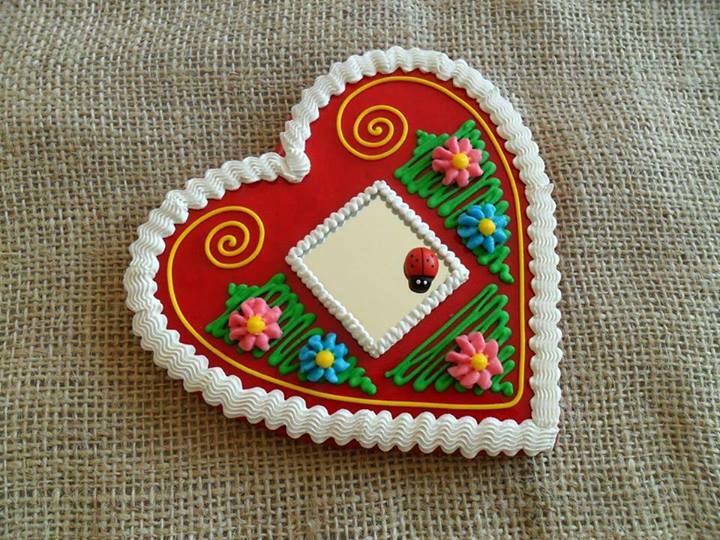 In the middle of the heart is a small mirror, and these ornaments, even though you can eat them, they are usually bought or given like a present. Actually, they can be in many shapes and forms, as a plant or an animal, but it’s origins are the heart shaped ones. Licitar Hearts are named by the old German word Lebzelter, but it’s not in use any more. Only people who had the permit to make this kind of cookies were well respected and honoured for their profession. This is just one of the piece of history of how these beautifully arranged cookies are made. At first, they were cookies for children, nowadays they are used as gifts, small but valuable, and every single one is different, unique, and amazing colours. Glazed with a red colour, and decorated on the sides, this is a true treasure for someone who knows to appreciate homemade crafts. Something else that is native to this part of the world is their well known Bovec Cheese. It is characteristic by its strong smell and taste, knowing that this cheese is made out of sheep’s milk. It takes about 60 to 90 days for the cheese to mature, but when it’s done, you’ll taste nothing like it. It’s has a hard on the sides, and has creamy inside. Many people who didn’t use to such a strong taste, will find the cheese with a small percentage of goat or even cow’s milk to slightly cover the hard taste and smell, but the real Bovec Cheese is made from 100% sheep’s milk, to at least the 80%, everything below is not real Bovec Cheese. Besides, they also make a Piran Salt, which is one of the most valuable salt and in general and widely recognized. It’s harvested by hands and only the finest grains that are on the surface is harvested and packed for sale. It was pretty uncommon taste and anyone who did try it can recognize the taste of this salt among the others. Sečovlje Saltworks is one of the largest evaporation ponds in Europe, which has been active since the XIII century. Nowadays, this is an old, almost forgotten place, but still, work in order to preserve the tradition and local customs. This part of the country is part of protected land in Slovenia, while Piran Salt has a protected designation of origin from European Union. In 1993. a saltwork was on the list of Wetlands Of International Importance. The salt is made by the special receipt, which dates back about 700 years, and not only that, the same tools are used to pick up the salt like in the old days. Harvesting salt in this area is based on several conditions which are the sea, the sun, the forces of wind and rain of course. For all that are chosen people who already worked in this field, showing great care and perseverance so that the finish product would become again the best on the market.